Your home is your showplace. 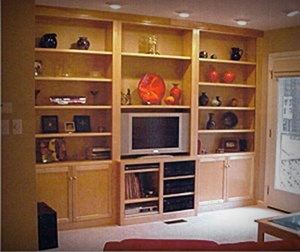 We help you build your style through standard and custom bookcases, entertainment centers, home office desks and storage units. Why would you want your furniture to look like everyone else's? What begins as a piles of wood becomes elegant wood furniture ready for your precise specifications. Whether your style is traditional, Shaker or European we can build custom finished and unfinished furniture to meet it. We make your dream furniture a reality with base options, moldings, doors, hardware and colors all customized by you. 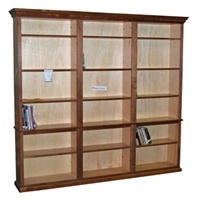 Your solid wood bookcases, desks, entertainment centers, storage centers and built-ins are waiting for you at Durham Bookcases & Other Cool Wood Stuff. Contact us today and let us help design furniture to meet your style. This wall unit is an example of traditional style. Dental crown molding and fluted facial trim make this bookcase wall unit a great example of the traditional style that we offer. 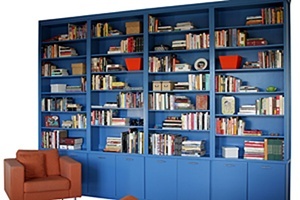 These library Bookcases are just one example of contemporary style. Flat slab doors, custom hardware and paint helped this customer create the mid-century modern style for a loft apartment on Mangum street in Durham, NC. The clean lines of this built in entertainment center define a loft or modern style. It features flat panel doors and is clear finished maple. 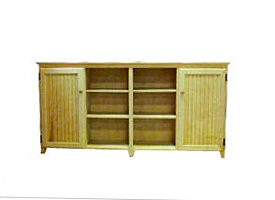 Entertainment centers, unfinished bookcases, dining room sideboards such as these are just a few examples of Durham Bookcases' Mission style. We also offer Mission Style on our tables and writing desks.